House prices in London's most exclusive and expensive areas have increased from £3.7m in Q2 to a whopping £4.7m in Q3, June to August 2014, a rise of 27%. Global property consultants Knight Frank identified Italians as the largest group of overseas buyers of prime London homes this year, accounting for 6% of sales according to the company's Prime Central London Index. The second biggest investors were the French, accounting for 4.1% of sales with Russians following at 3.8% of sales as London re-emerged as a safe-haven against spiralling domestic taxation or further threats of sanctions. 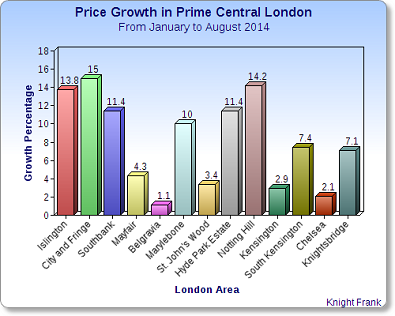 Head of London residential research at Knight Frank said: "The average sale price in prime central London between June and August 2014 was £4.7m, up from £3.7m in the preceding three-month period. The 27% increase underlines how a growing group of vendors are adjusting to the fact demand is cooling, the result of uncertainty surrounding a future interest rate rise and the outcome of next May's general election." Italy's economy has struggled perhaps the most in Europe and on August 6th, Italy's Prime Minister Matteo Renzi disclosed that the country had shrunk back into recession after GDP fell by 0.1% in Q1 with a further 0.2% drop in the second quarter. 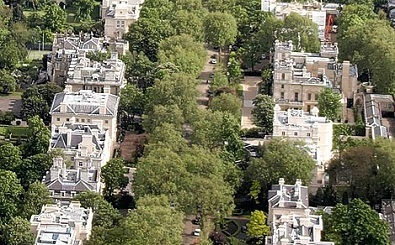 In France, Socialist president Françoise Hollande made himself deeply unpopular by implementing radical fiscal reforms with threats of an excruciating wealth tax of 75% for those earning more than €1m and so it is hardly surprising that the richer classes are looking to London property as a vehicle to protect their capital. 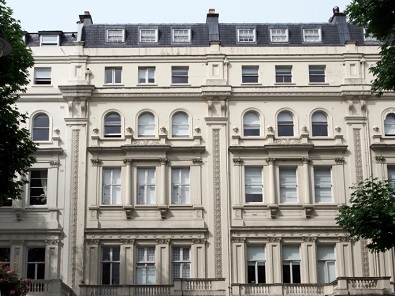 The resulting exodus of investors from Italy and France has driven a 17% increase in the number of sales in London above £5m between January and August 2014 compared with the same period last year. That compares to a 7% rise across all price brackets according to the report. Annual price growth was recorded at 7.7% in August after an increase over the month of 0.3%, equal to the rise in July. Monthly growth has not been as low for two consecutive months since a period four years ago when concerns were intensifying over the Eurozone sovereign debt crisis. 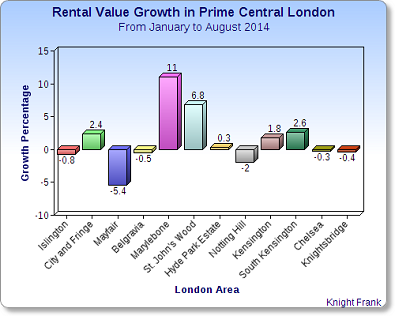 According to Knight Frank's Prime Central London Rental Index there is an indication that short-term concerns over the possibility of rising interest rates together with a longer-term shift in the employment market is driving a rental recovery, as rental values rise for the sixth consecutive month representing the longest run of growth in three years. The rental index for properties in central London was pushed to its highest level since November 2012 by a rise of 0.5% in August showing annual growth to be at 1.2%, the highest rate in more than two years. Rental yields in London's prime markets are still disappointing relative to other opportunities in the UK's regional cities, mainly due to exponential price rises in the capital. However, rental yields in central London increased for the second month running to 2.82% which is the first consecutive increase since the middle of 2011. Due to the sharp rise of buying in London's prime property markets and within the climate of rapidly increasing prices, more and more property investors are shifting focus outside London in favour of the higher rental yields available in regional cities. Throughout the UK property prices have increased although in some regions, at much more modest rates to those seen in London. A lower purchase price combined with strong demand for rental properties ensures a more solid return on investment outside the UK's capital city at the current time.